Cast: Anthony Hopkins, Chris Williams, Aaron Murphy, Christopher Lawford, Diane Ladd. Story: A sixtysomething New Zealander tries to break the "motor-sickle" land speed record in the 1960s. The World's Fastest Indian is a gem of a movie. Touching, endearing and beautifully acted, it's one to buy and savour on a cold winter's night. And not a Jalfrezi in sight. Anthony Hopkins makes this movie. His portrayal of Burt Munro, game old duffer trying to break the land speed record on a home-made bike, is nothing short of seminal - one of the best performances by anyone, let alone the man himself. Burt's a lovable old stick in the hands of Sir Anthony, nothing fazes him and he gets along with anyone and everyone, provided they don't get in the way of his record attempt, of course. He's the kind of chap you hope you'll become when the years have accumulated, burning your garden because you can't be arsed to mow the lawn. On his way to Bonneville Salt Flats in order to set the record, Burt encounters many trials and tribulations and befriends transvestite Tina along the way, responding when the penny drops in his usual amiable manner, "oh. I thought there was something odd about you." 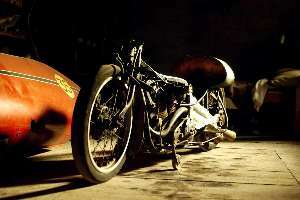 The World's Fastest Indian is a subtle classic, a masterclass to anyone studying dramatic arts. Anthony Hopkins simply excels in the lead role and for this reason alone it's well worth seeing - as long as you don't expect The Fast and The Furious. Given Burt's seniority, I suppose it could be subtitled The Fart and The Futureless. I think the average moviegoer will enjoy it: 4/5 - it needs the right audience though. Testosterone Satisfaction Rating: 1/5 - very little in the way of high speed thrills, despite the basic plot. To enjoy this film you should: like warm human-centred talky stories and not require any action. The World's Fastest Indian is released in the UK on 10th March. I'm glad I didn't read any reviews (except Jimbo's) before seeing this film or read any Bert Munro biographies, my interest was held through the film much better. Heck, I don't even like motorbikes, I simply enjoyed seeing him pursue his dream. The film explodes the myth that senior citizens can't have fun and frolics. It's enviable how everyone can't help liking him, he lets everything wash over him (except obstacles to racing), yet he's no fool. The film reminds me of "The Dam Busters", where almost all of the time is the build-up to the final event. It will provide some useful pointers to anyone who has a burning ambition.